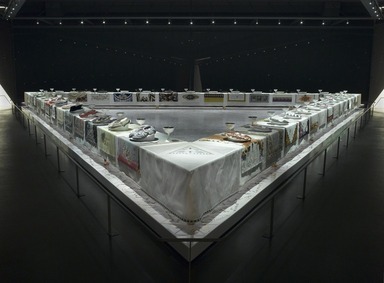 Judy Chicago's The Dinner Party is the most significant icon of 1970s American feminist art. Begun in 1974 and finished in 1979, with the help of hundreds of collaborators, the large-scale work celebrates the achievements of 1,038 actual and mythical female figures, most of whom have been neglected by history until they were reclaimed by feminist scholars. In honoring those Individuals, the work at the same time pays tribute to all women who have been lost to history. 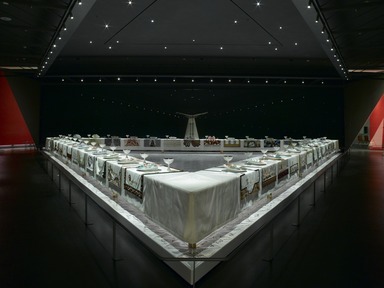 The Dinner Party consists of a series of Entry Banners, a Heritage Floor, and a massive ceremonial banquet, arranged on a triangular table measuring forty-eight feet on each side with a total of thirty-nine place settings. 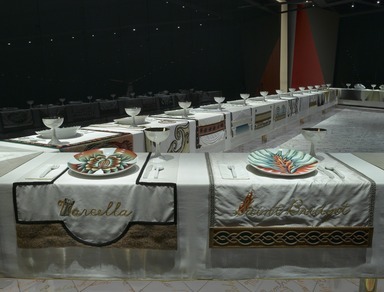 The "guests of honor" commemorated on the table are designated by means of intricately embroidered runners, each executed in a historically specific manner. 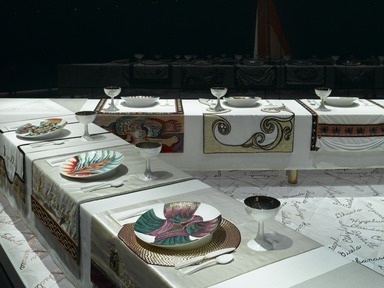 Upon these are placed, for each setting, a gold ceramic chalice and utensils, a napkin with an embroidered edge, and a fourteen-inch china-painted plate with a central motif based on butterfly and vulvae forms, and rendered in a style appropriate to the individual woman being honored. The names of the other 999 women are inscribed on the hand-cast title Heritage Floor below the triangular table. This iconic work remains important on many levels. Not only was it the first truly monumental work of American art, conceptualized by a woman, to survey the contributions of women to Western civilization over the millennia, but its feminist reclamation of several "crafts" traditionally associated with women (embroidery, needlework, china painting, ceramics), and its utilization of "central core" (or vulvae) imagery, were virtually unprecedented in artistic production at that time. 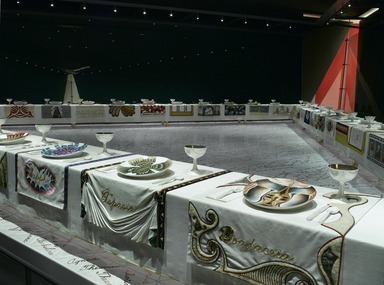 Having The Dinner Party at the Brooklyn Museum is particularly fitting, since the Museum exhibited it in 1980 as part of the work's initial tour. Returning to Brooklyn, it serves at the central installation of the Elizabeth A. Sackler Center for Feminist Art, thus preserving for posterity a visual symbol that the artist created specifically "to end the ongoing cycle of omission in which women were written out of the historical record." Through the generous gift of Elizabeth A. Sackler, the Brooklyn Museum has eagerly taken on that mission. October 7, 2006 Imagine the most powerful and provocative women who have ever lived. Then imagine them sitting down together to share a meal. 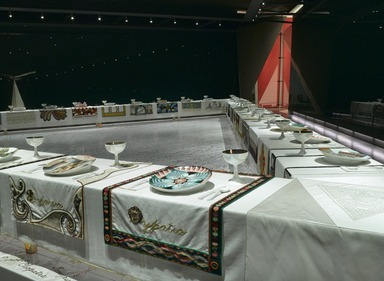 In that startling, impossible, but extraordinary idea lies the seed of one of the most famous works in the history of American art, Judy Chicago’s The Dinner Party. 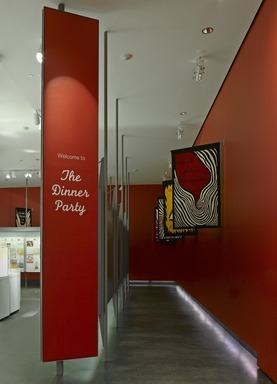 Now, with the Grand Opening of the Elizabeth A. Sackler Center for Feminist Art at the Brooklyn Museum on March 23, 2007, The Dinner Party will be restored to public view on a permanent basis. Widely regarded as the first epic feminist artwork, the monumental installation functions as a symbolic history of women in Western civilization. 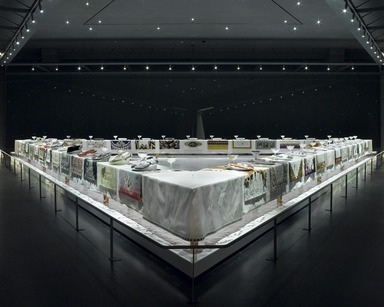 Upon entering the installation, a viewer sees 39 elaborate place settings carefully arranged along a massive triangular table. Virginia Woolf, Susan B. Anthony, Sojourner Truth, Eleanor of Aquitaine, and Theodora of Byzantium are among the guests, as is Hatshepsut, the first female Pharaoh, who is also the focus of a companion exhibition at the new Center. Pharaohs, Queens, and Goddesses, the adjacent presentation, draws objects relating to Hatshepsut and several other of The Dinner Party’s guests from the Museum’s renowned Egyptian collections in order to explore changing interpretations of Egyptian art and life (also opening March 23). The Dinner Party honors the achievement of women over the millennia in craft forms associated with the domestic, or feminine, realm. Each table setting, unique to the woman whose life it honors, includes a hand-painted china plate, ceramic flatware and chalice, and a napkin with an embroidered gold edge. The settings rest upon elaborately embroidered runners, executed in a variety of needlework styles and techniques taken from the periods in which these women lived. 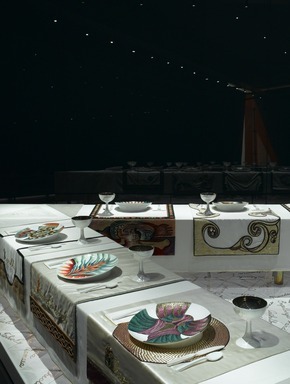 Chicago’s triangular table is configured so that one wing represents women from prehistory through classical Rome, beginning with Primordial Goddess and ending with Hypatia, symbolic of the decline of the classical world. Another wing begins with Marcella, denoting the rise of Christianity, and concludes with the 17th-century Anna van Schurman. The final side begins with Ann Hutchinson, symbolizing the beginning of the American Revolution and modern civilization, and ends with the place settings offering tribute to Virginia Woolf and Georgia O’Keeffe, who represent for the artist that historical moment when women began to find and create a uniquely female voice in literature and in art. 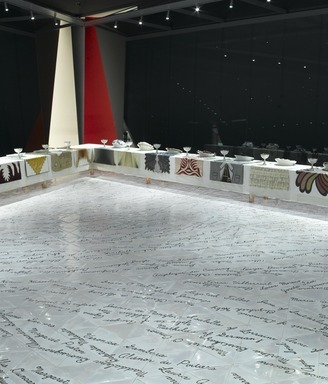 The set dinner table stands on The Heritage Floor, made up of more than 2,000 white luster-glazed triangular-shaped tiles, each inscribed in gold script with the name of one of the 999 women who have made a mark on history. 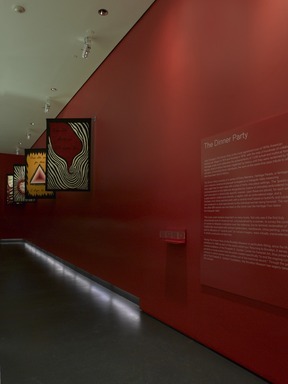 In the installation at the Brooklyn Museum’s Elizabeth A. Sackler Center, the Entrance Banners, Heritage Panels, and an extensive online database dedicated to this iconic work, will help illustrate the contributions of these women and credit the many participants who made possible the realization of The Dinner Party in the 70s, and today. For the first two years of the project (which eventually took more than five years to complete), Judy Chicago worked alone in her Santa Monica workshop conceiving and executing her extraordinary vision. However, the undertaking proved so ambitious that eventually 400 women and men from all over the country became involved, volunteering their time, from a month to several years, to work on this installation. One of Chicago’s aims was to end the on-going cycle of omission in which women’s achievements are repeatedly written out of the historic record, a cycle of repetition that results in generation after generation of women struggling for insights and freedoms that are too often quickly forgotten or erased again. 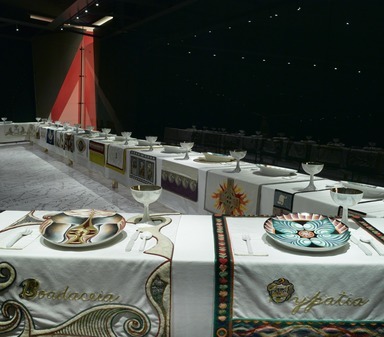 Judy Chicago, whose name has become synonymous with feminist art, grew up in Chicago and later took the name of her hometown as her surname. Educated in California, Chicago’s early work spanned several styles, including minimalism, abstraction and finally the evolution of a feminist art practice. In 1970 she pioneered the first Feminist Art program at California State University, Fresno. Prior to creating The Dinner Party Chicago had been showing for over a decade and struggling to create a feminist art practice. 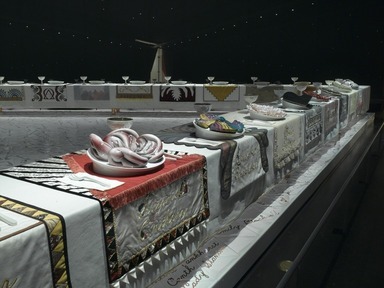 The Dinner Party, at once representative as well as conceptual art, utilizes a wide range of crafts generally regarded as women’s work. “Tell women’s history through woman’s crafts,” Chicago has said. 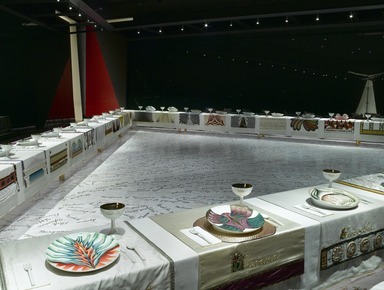 The Elizabeth A. Sackler Foundation purchased The Dinner Party from the Judy Chicago Charitable Trust whose future mission, upon the death of the artist, will be to support artists, writers, and scholars whose works expand the vision embodied in The Dinner Party.